Nuestro nuevo cubo de basura rectangular de doble compartimento con pedal de acero inoxidable te permite clasificar de forma ordenada tu basura orgánica y reciclada en poco espacio. En un lado, incorpora un innovador «guardado de bolsa de basura» que almacena y dispensa bolsas de basura desde el interior del cubo para facilitar el cambio de bolsa. En el otro, incluye un práctico cesto de reciclaje con asa, que permite sacarlo y vaciarlo cómodamente. El borde de soporte de la bolsa de acero inoxidable sujeta la bolsa y la mantiene oculta. El pedal de acero macizo ancho está diseñado para durar, y nuestra patentada tecnología de tapa Shox garantiza un cierre suave y silencioso en cada momento. El borde de soporte de la bolsa de acero inoxidable se levanta para poder cambiar la bolsa de forma rápida y sencilla, se cierra sobre la bolsa sujetándola firmemente y la mantiene fuera de la vista. Mantén las bolsas de basura donde las necesitas. Dispénsalas desde el interior del cubo para facilitar el cambio de bolsa. Diseñados para introducirse en la parte trasera del almacén de bolsas de basura incorporado. Protege el acero inoxidable contra huellas digitales y gérmenes. Al eliminar la cesta interior, hemos logrado obtener la misma capacidad con un cubo más pequeño y eficiente. Un lado para la basura orgánica y otro para productos reciclables. Nuestra patentada tecnología de lid shox controla el movimiento de la tapa para conseguir un cierre lento y silencioso. Evita que la tapa golpee la pared. El acabado antihuellas resiste a las manchas para mantener el acero inoxidable reluciente. Nuestras bolsas de basura de código H están diseñadas para ajustarse a la perfección a cada uno de nuestros cubos de forma que no se escurran y permanezcan completamente ocultas. Su fabricación en plástico extragrueso y con costuras dobles evita desgarrones y roturas. Very good quality! We are very satisfied with our choice. Little problem with finding perfect trash bags since originals are little to expensive. We love the design of this bin. One minor glitch, it has developed a squeak as the lid closes. We are absolutely pleased! It's exactly as described. The perfect size! 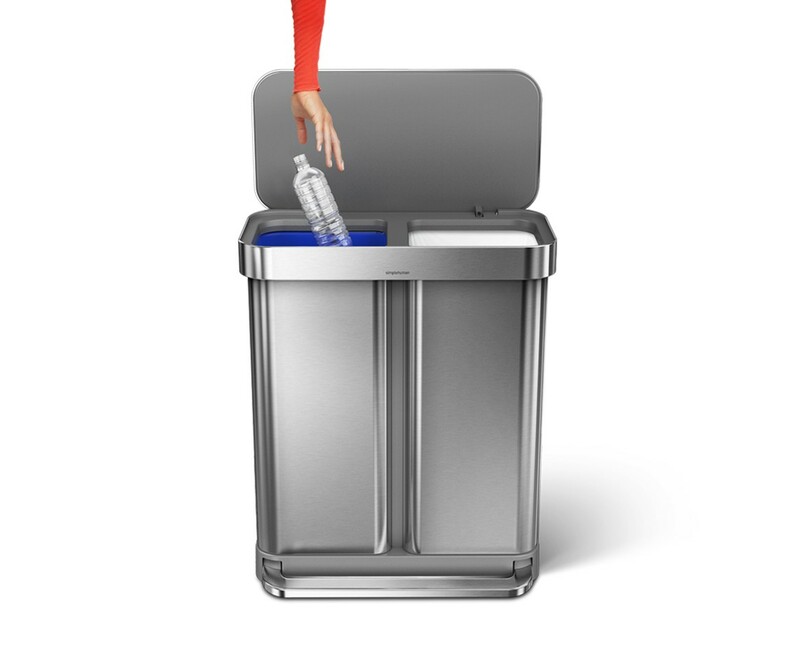 Holds both trash and recycling and keeps odors contained. Very stylish also. This is exactly what I was looking for. The recycle bin is very easy to remove and the hidden trash bags are very convenient. I would recommend this to anyone looking for a dual trash/recycle trash can. LOVE this can. Solves the problem of what do to with plastic drink bottles in a small kitchen with no built in recycling capabilities. This was the one solution my daughters and I could agree on! As many others have said, while pricey this is absolutely worth it. Works exactly as described and looks sharp too. 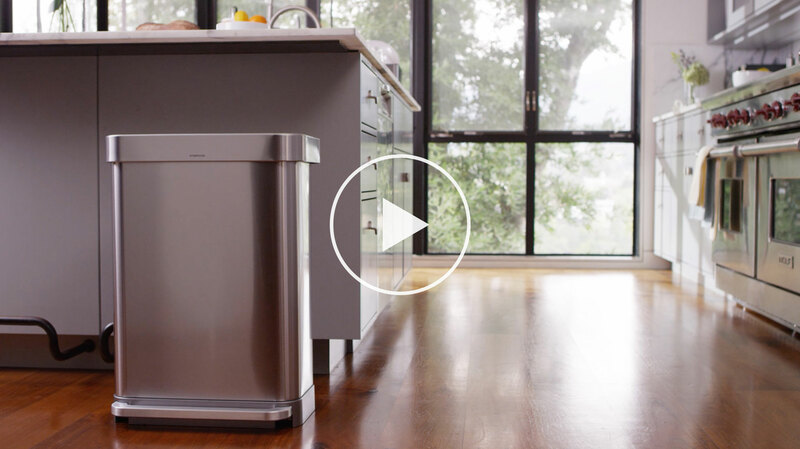 Extremely well designed with plenty of capacity for both garbage and recycling. Stainless steel finish doesn't show fingerprints easily either and only requires the occasional wipe to clean. Quality product. I will never have to buy another trash can again. And it's so easy to change and replace the trash bags. I wanted to consolidate my 2 containers, trash and recycle, into 1 container. I looked around quite a bit and kept coming back to this one. This one is perfectly sized for my needs and the stainless steel matches the rest of my kitchen appliances. It is well designed, attractive, and built to last. Granted, it is not cheap, but worth the money. Simple Human customer service is truly exceptional! This is one of many Simple Human products I now own and will surely not be the last. Eindelijk een afvalbak die er mooi uitziet en erg degelijk is. Ook het voetpedaal is stevig uitgevoerd en kan van alle kanten bedient worden. Sluit erg mooi af zonder lawaai. It could be art it's so attractive but it's even more functional. I love the 2 compartments and the ease of lifting out the trash or recycling "pail". And you never have to touch it with your hands to open it. Well worth the money. Spacious, Beautiful, Functional and STELLAR Customer Service!! I am THRILLED with my purchase of this newest trash can to the Simple Human lineup! Actually, I had never heard of Simple Human products until I began looking for a stainless steel trash can on a well-known discount department store website. They did not carry the Simple Human brand yet someone gave Rave reviews for the Simple Human products when comparing it with the cheaper can they had purchased from this discount department store. That's when I put the brakes on and began researching further. The first trash can I received had been damaged in shipping. Simple Human had it picked up by the carrier the following day, and the next day after that I had a brand new can; this time double-boxed for shipping. It arrived unscathed. The can is gorgeous! I worried about the industrial look to it (not flat stainless steel like the rest of SH models) but once I got it in my kitchen, wow, BEAUTIFUL! It has a very spacious recycle bin on the left side which also comes with a pull-out plastic bucket so that the User doesn't have to waste trash bags, thus making it a breeze to take recyclables to the main dumpster. This would be perfectly great for individuals living in an apartment or condo complex, yet also makes it simple for the Homeowner as well. I LOVE this feature! The right side is used for trash and has a very handy trash bag holder for easy replacement. When the lid is closed, the User will not see any remnants of a trash bag nor the recycle container; it will still look like the photo above. The other reason why I chose this latest can over earlier models is because I recycle more than I have trash, so I wanted something spacious and equal on both sides. Enter the 58 litre, dual compartment can - it's beyond perfect! Exactly what I wanted! One reason why I chose Simple Human besides the Rave reviews I had read was because I could not find any other can with the elongated foot pedal found on this brand. I don't want to have to look or feel for a foot pedal; I want it long enough where my foot can hit it spot-on every time. The lid opens and closes so incredibly gracefully and is designed to never hit the back wall. The surface is exactly as advertised: finger-print proof --- AMAZING! I specifically did not want any can that was battery-operated; I wanted a can that was durable and simple to use with minimal parts to eventually breakdown. This trash can proved 100% and more of what I desired. This dual-use trash can is worth every penny spent on it. 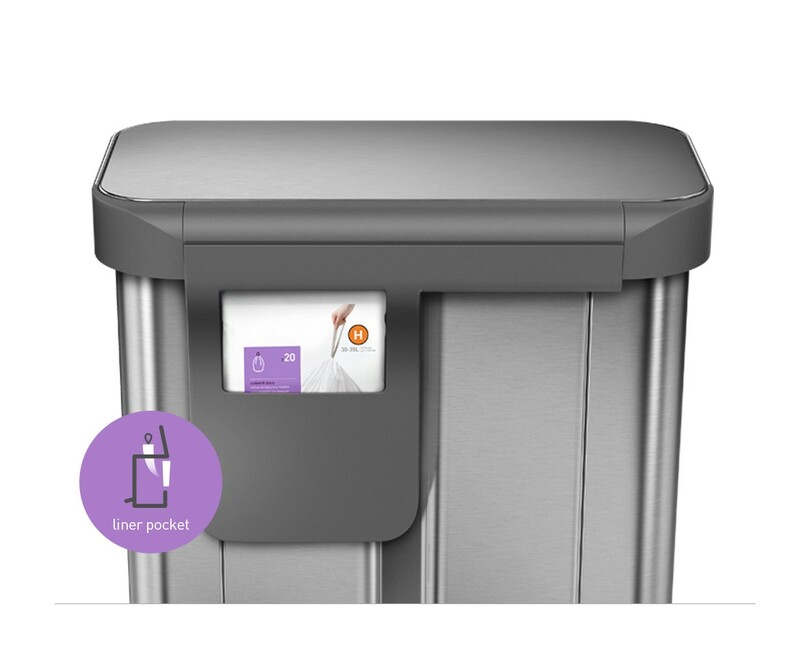 You get what you pay for and in this case, YES, spend the $200 for this fantastic trash can with STELLAR customer service! Thank you also for the extra shipment of trash bags due to the damaged can from shipment and also THANK YOU for my birthday t-shirt! It is gorgeous, soft, so breezy-cool and will be going on my trip with me to Maui! Thumbs Up 100% for this product! Get it right the first time: buy Simple Human products! Yeah what can I say -- this is one of the best trashcans ever. Really nice design and will probably last forever. (And if it doesn't there's a ten year warranty, I think). Comes with it's own trash bags, even, which I'd definitely use in future, except they seem a bit expensive and I'm not big on spending a lot of money for custom-made garbage bags. But who can complain really. The only way this thing could be any better is to have THREE compartments -- one for garbage, one for recyclables, and one for paper, but don't see how that's possible to design! Thanks Simple Human, your designs are fantastic. And very well made. Worth every penny. So glad you are enjoying your can. Yes! This can does carry a 10 year warranty. I bought this as it was the best available on the market at the time with both an integrated recycling bin and a trash can. I wish the trash can were a little large compared to what I am used to. I do find myself taking the garbage out more often, however, I am also recycling more and that was the goal overall. I like the fact they are in one device and that I don't have an open recycling container on the floor for my some so play with all day. Overall, exactly what I wanted, just wish the garbage side was slightly larger by a couple gallons. Love it. The best purchase I've ever made for the kitchen. I strongly recommend it. Well designed, aesthetically pleasing, and most of all, extremely functional. It's big enough to hold a week's worth of recycling/garbage and looks good in a kitchen. The lid holds itself up to change the liners/remove the recycling bin which is also nice. I was skeptical about the proprietary liners, but they are high quality, fit like a glove, and the dispenser is convenient and more than makes up for the slight premium over regular bags, especially when you buy in bulk directly from Simple Human. So clean and streamlined. Love this product. Pocket is nice to for refill purposes. My sister has the smaller size (46 litre maybe? ), and she wishes she had mine. If you're reading reviews because you're considering buying, believe me you will use the recycle bin a lot, possibly more than the regular trash. We've been using simple human for our trash cans, soap dispensers and other items for years. They do make things simpler. We just upgraded from the single container to this dual compartment one. I do wish that there was one size bigger, as each compartment is a little smaller than what we'd like. Maybe a 70 litre option? Also noticed that when you step on the pedal to open the top, some of the top open cover moves on one side. Could be sturdier. Our last one lasted years, so I'm hoping this items is as good. thank you. We love our new 58 liter garbage/recycling can. Fits perfectly in the space and the recycling pail is easy and convenient. throwing &*([email protected] away is a pleasure. bagging !$#&*(@ up is a pleasure. taking #$*&(! out is a pleasure. i love this garbage can as much as a man could without being arrested. thank you simplehuman. 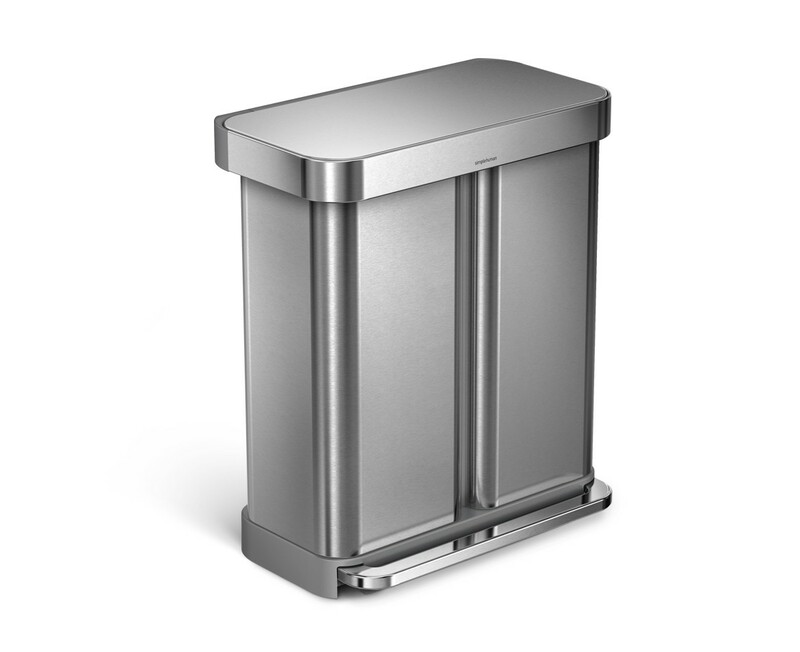 I thoroughly researched many garbage cans before making this purchase and can say that it does everything it says it does so meets our functional need but the stainless sides are flimsy and dented from use. The issue is that the garbage side is single layer construction with no liner (recycler has liner bucket) - we have a dent on the side of the can that really sticks out every time you walk by the garbage. I never inspected the can when it arrived so it may have come this way but the more likely explanation is that the can dented when a solid object was thrown in the garbage and bumped into the side of the can thus causing a dent that cannot be pushed back in - this happened within the first month of having the can. If there was a liner like there is on the recycler side this dent would not have occurred. I also bought two of the carbon filters, one for each section, and within a week of use the filter part fell out unknowingly and got thrown out with the trash. I love this trashcan/recycler! It is absolutely perfect - good size and looks great out in the kitchen! We love it!!! Best thing we bought, we really like liner pocket in the back.would recommend it.. Well worth the money. I bought this trash can because our recycling didn't make it into the bin inside the pantry too many times. The problem has been solved completely. I have no more recycling items sitting on the kitchen counter or elsewhere. It makes is easy to just put it in the right place. The garbage compartment is a really good size and having storage for the refill bags is a nice add on feature. In addition, this is the best looking trash bin that I can imagine. It looks really good in the kitchen. An added bonus is that guest now also recycle as they see the recycling bin when they open the lid.